Celebrating 25 years of FBM bike company!!! 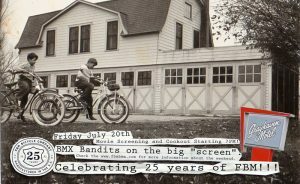 Following the Flyout World Championships at the Ithaca Skatepark we’ll be ringing in FBM’s 25th anniversary weekend with Hot dogs, Not dogs, And BMX Bandits on the big “screen”. We’ll be lighting the charcoal at 7pm. Movie starts at 8:45pm. Check the FBM blog for more information about the weekend.